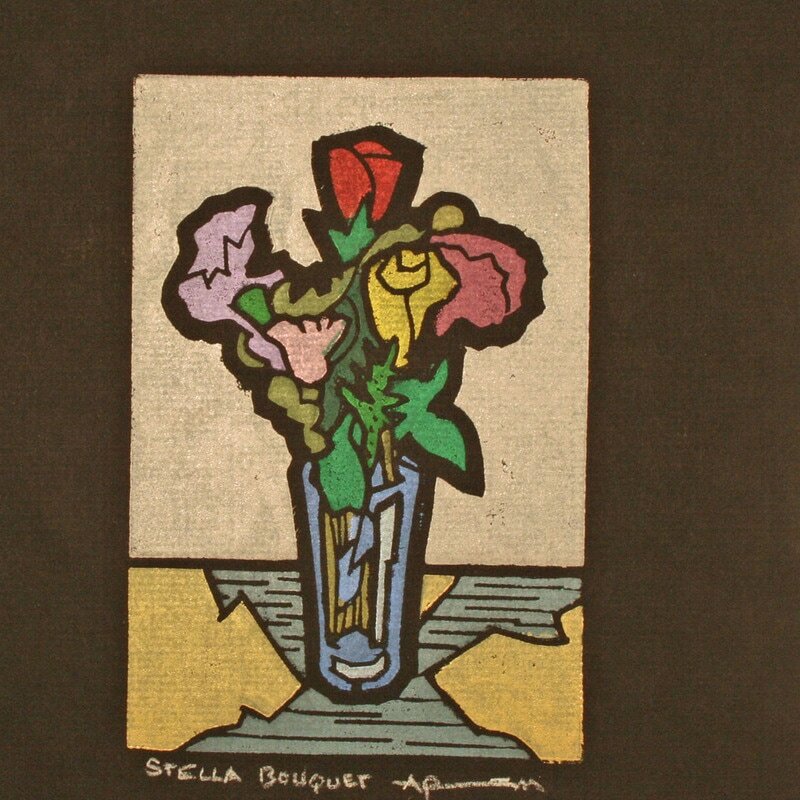 ​Stella Bouquet; color linocut; 3 3/4" x 5 1/2"
Stella Bouquet is a small (3 1/2 x 5 1/2") linoleum block print (linocut) of fourteen colors. It was printed during the confined period of the massive Stella snowstorm of March 15, 2017, hence the title. I will quote from the poet May Sarton's Journal of Solitude to explain the expressive content of the work: "When I am alone the flowers are really seen; I can pay attention to them. They are felt presences. Without them I would die. Why do I say that? Partly because they change before my eyes. They live and die in a few days; they keep me closely in touch with process, with growth, and also with dying. I am floated on their moments." It is my hope that the viewer of this modest print is floated by the moments looking at it. Earlier, before the storm I was able to visit one of the best art supply stores in the country, Artware in Oneonta, NY. Here I found the Strathmore black paper that carries the print. Black if used as a mixture to colors flattens and kills the color, but when black is next to color it enriches color. Of course there is much rhyming of the complements of purple and yellow and the gray background color is a neutral of purple and yellow. Variety of line width is vital to the print which permits the use of different Speedball cutting tools with which I draw-plow into the block very similar to burin engraving on metal. Before cutting I create a drawing on the block with pencil and always from life and yes, only real flowers. I first establish a "key" block which carries the total design. After obtaining satisfactory proofs of the key block I then begin the labor-time intensive process of printing the separate colors. Stiff plastic stencils are cut for each of the local colors (note: a wide line width is vital to this procedure). One color is inked and printed (burnished with a wooden spoon) for each color. Multiple prints are made and often different editions are created using different colors, papers, etc. So very much can go wrong with the methodology, thus great concentration is demanded. Depending on the number of prints proofed or editioned each color in the small blocks such as this takes about a half hour. When all is finished people should say as they often do, "Oh, that's simple. Its just a linoleum block print." ​James Mullen is retired as Professor of Art and Dean of Humanities and Fine Arts at State University of New York at Oneonta where he taught courses in drawing, design, printmaking and art history. He is an elected member of Pennsylvania Watercolor Society, Connecticut Academy of Fine Arts and Society of American Graphic Artists. He has exhibited his work widely in juried national exhibitions with Purchase Awards to a range of Collections.